What is the Encinitas ADU Ordinance? The purpose is to fast-track permits and waive fees and set architectural and design guidelines. The backyard home event occupied both the main chamber and the adjoining hearing room. (200+- in attendance). If you missed, you will have another opportunity on Monday, March 11th, from 5:30-8PM at the Encinitas Library. Additionally, the “Everything ADU Open House” was a huge success as well with well over 400 folks in attendance. City of Encinitas staff and the PRADU (Permit Ready Accessory Dwelling Units) Program presented their architects pre-approved designs along with alternative options like factory-built and prefabricated BACKYARD HOMES. Representatives were on hand to discuss the City’s new Permit Ready Accessory Dwelling Units (PRADU) Program aka Encinitas ADU Ordinance. This changes the City’s Accessory Dwelling Unit zoning code, and SB 1226 and the Affordable Unit Policy (AUP). The City of Encinitas leads the entire state of California in their very proactive and progressive implementation of the newly enacted Senate and Assembly bills passed in 2017 and 2018. The Encinitas ADU Ordinance has streamlined the process and waved all permit fees and zero school fees for any backyard home under 500sf. Additionally they are waving grading fees. Encinitas ADU Ordinance Fast-tracks Permits and Waives Fees. PRADU Studio now permit ready. The most exciting news is that the “Pre-Planned Approval” process simplifies and fast tracks the entire permit building and/or installation process. Encinitas has selected and pre-approved an array of very creative floor plans and elevations created by two local architects. They can be approved at the counter without the customary time consuming and costly plan check and permit processing procedure. You also have the option of selecting alternatives i.e. factory built manufactured, modular and prefabricated backyard homes. You can also convert an existing room in your primary residence into a Junior Accessory Dwelling Unit (JADU). Or add a room addition up to 500sf beyond the footprint of your primary residence. In fact Encinitas will allow both an ADU and a JADU on the same property as long as it complies with all the required setbacks. The Encinitas ADU Ordinance clearly leads the pack in embracing these very timely and important new State laws that allow you to maximize and realize the full potential of the land you own beneath your feet. For those property/homeowners who have an unpermitted or non-conforming Accessory Dwelling Unit on there property under the recently enacted California Senate Bill 1226, you can now apply for an “As Built” permit that was in effect in the year the ADU was built/installed without penalty or condemnation. 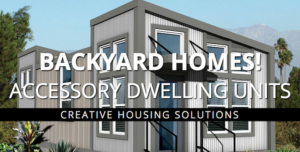 If you would like to have a more in depth and comprehensive overview about backyard before you attend the workshop please download our ‘BACKYARD HOME GUIDE – Everything You Need To Know About Building An Accessory Dwelling Unit’. We will be on had at the open house to answer any questions. Look for CREST BACKYARD HOMES at one of the tables.